As oxygen diffusion into the crevice is restricted, a differential aeration cell tends to be set up between crevice (microenvironment) and the external surface (bulk environment). The chronology of the aggravating factors leading to a full blown crevice is illustrated here. The cathodic oxygen reduction reaction cannot be sustained in the crevice area, giving it an anodic character in the concentration cell. This anodic imbalance can lead to the creation of highly corrosive micro-environmental conditions in the crevice, conducive to further metal dissolution. This results in the formation of an acidic micro-environment, together with a high chloride ion concentration. All forms of concentration cell corrosion can be very aggressive, and all result from environmental differences at the surface of a metal. Even the most benign atmospheric environments can become extremely aggressive as illustrated in this example of aircraft corrosion. The most common form is oxygen differential cell corrosion. This occurs because moisture has a lower oxygen content when it lies in a crevice than when it lies on a surface. 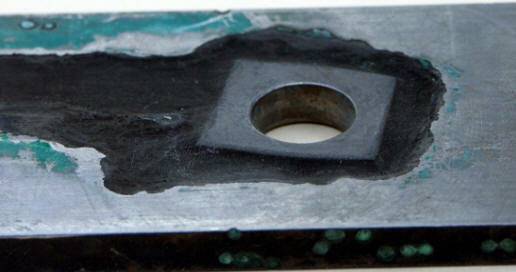 The lower oxygen content in the crevice forms an anode at the metal surface. The metal surface in contact with the portion of the moisture film exposed to air forms a cathode. Explain in your own words the role played by dissolved oxygen in the general mechanism proposed to explain the various steps in crevice corrosion.